What was the first time you ever experienced Kale? And how did that experience lead into your now healthy obsession with the Queen of Cruciferous veg? The first time I ate kale regularly was as a medical student on a rotation in El Doret, Kenya. There is a traditional dish – Sukuma wiki – a simple sauté of kale or Collards.. It translates to “push the week”. Who knows how we all caught kale mania! I was a strict vegetarian for 12 years, so I’ve always eaten lots of leafy greens. I think this recent obsession started with Farmer Dave’s kale at the GrowNYC Abingdon Square Farmer’s Market. Awesome kale. Who knows how these things happen. A few summers ago we had a majestic Collard plant so big it seemed Paleolithic. All the varietals of kale and collards just got me curious. As a physician interested in food as both prevention and treatment, I got really excited about kale because it teaches us such important lessons about food, namely: nutrient density, the power of phytonutrients, culinary versatility, and importance of local food. 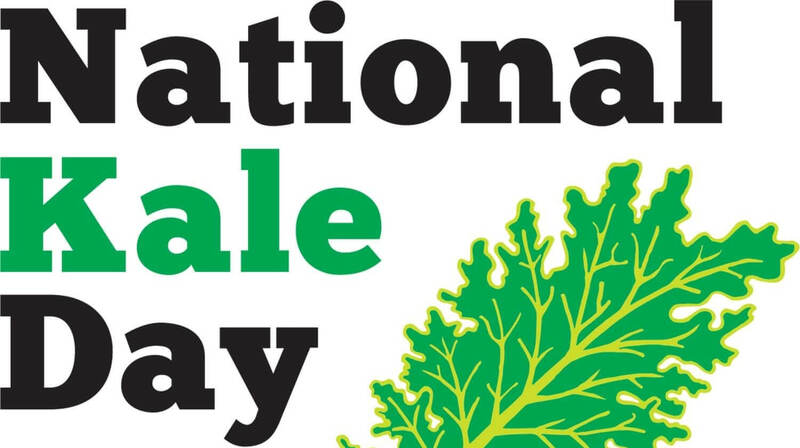 That’s why my amazing co-author and friend Jenifer Iserloh and I co-founded National Kale Day: to celebrate kale’s virtues. Sign the petition! What is you favorite type of Kale? I tried to grow fifty varieties of kale on our family farm this summer. We had some flooding issues but managed to get 37 varietals producing. So I have a few favorites! We enjoyed making wraps using Beira or Portuguese Kale. This is also great for the traditional Caldo Verde soup. I really enjoy an All Kale Caesar salad with Redbor or Red Russian kales. The more curly varietals like dwarf blue vates and green curly are the best for a crunchy kale chip. And then there are some rare varietals like Gulag Stars and Extremist Agreements that have great names. Your practice is based on psychological wellness and healthy eating. How does this relate to those going through cancer treatment? Cancer treatment is hell. You must be resilient and both the cancer patient as well as the family and support circle need to build resilience with nutrient dense wholesome food. After a cancer diagnosis and during treatment, the risk of depression is huge, and symptoms like fatigue, cognitive fog, and sadness are experienced by most. Food is the most important environmental factor we control. A well-nourished brain is a more resilient brain – why I love Ann’s work and Cook for Your Life! Some molecules from plants have documented anti-cancer activities. And, food is more than just nutrients, much more happens at a meal: family time, sharing, laughing, recovering. I lost a close family member a few years ago to breast cancer. All my favorite memories of our best times together were in the kitchen. You also talk about the connection between healthy eating and brain function. Can you give us a very basic explanation of how this works? There has been such a flood of data connecting food and brain function over the past five years. On the most basic level this makes sense to everyone, how we eat dictates much of how we feel. Nearly every molecule in your brain started at the end of your fork. The are clear examples of specific nutrients deficiencies like vitamin B12 and folate, that cause brain health issues like depression, irritability, anxiety, and cognitive decline. Increasingly we understand the important role of the omega-3 fats in mood regulation. Additionally, we now have consistent data indicating that dietary pattern is a major factor predicting the risk of depression, ADHD, and cognitive decline. As a psychiatrist and lover of kale, what would you say to a cancer patient who has lost their appetite to convince them to eat healthy food? This is such a hard situation. I tell them every little bit helps and I remind them to eat really nutrient dense foods and nourishing foods like soups and even eggs and meat. Or ice cream. And I ask patients to keep experimenting to find what works – I’ve heard about the Cook for Your Life “Miracle Chicken” that patients who eat nothing still enjoy. That is a real treasure. What is your most convincing argument for a cancer patient or survivor who is resistant to adding kale or other leafy greens to their diet? This is the best tasting medicine we have to offer! The key is learning to make it tasty. Kale’s power for cancer patients is in its culinary versatility. There are so many ways to get those cancer fighting moelcules in your diet. Kale chips are an easy start. I love the Blue Kale Smoothie and the Kale Cherry Sorbet in 50 Shades of Kale. And Kale and Eggs is delicious. Don’t boil kale! We know you also grow kale on your farm. How do you grow kale? What is the importance for organic vs. non-organic specifically for the cancer patient? Put seeds in the ground! Kale is easy to grow – you don’t need a garden, as a window box or flower pot will do. Kale is important to purchase organically. Conventionally grown kale is on the Environmental Working Groups “dirty dozen”. We don’t know the exact effects of pesticides on health, I’m not sure we will anytime soon. But no one is arguing that they are good for your health. Organic produce tends to have more nutrients. During cancer treatment, particularly chemo, many people’s sense of taste changes. Foods that were once favorites can suddenly become unpleasant tasting or even nauseating to them. This can obviously be very traumatic and emotional? Do you have any advice for people going through this? Remember treatment is a temporary phase and changes in taste and appetite aren’t permanent. Eat and enjoy whatever you can. As a doctor what are your thoughts on the current role of nutrition education in medical schools? Columbia University has a great nutrition department and a program that specifically trains doctors. In the 1970’s the National Academy of Sciences surveyed medical schools and physicians got about 27 hours of training over four years of medical school. They recommended much more nutrition be integrated into medical education. We’ve gone down in hours of training since then, I think 19 hours was the last count. But the simple truth is that physicians don’t need much more education about food. Good doctors know that good food is good medicine. We need more encouragement and reimbursement for creating nutrition-based preventative programs. Health care in America will fail unless we change how we eat.